LA staple, Skullphone has teamed up with us again! 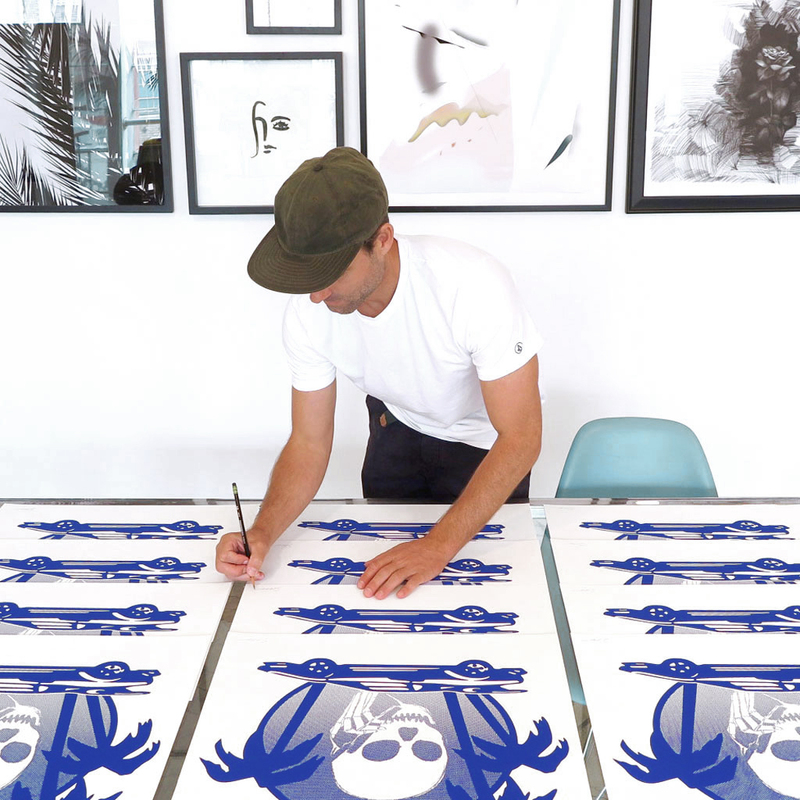 This time with a three-part series; The California Collection represents aspects of the city we can all appreciate. We found a few minutes to acquire some details on these select pieces. Can you tell us about this poster series? Well, we started talking about the West Covina image becoming a print and it came up to possibly do a collection of prints that would hang well together. The West Covina image is soooo California – and so cheesy too, right? But in a nostalgic late eighties good way! So I was thinking about other California things in my life. In the early 2000’s I created a very small edition of intaglio prints, one of which the Soho House acquired for their West Hollywood lobby. It has a small Skullphone in the middle of a large white piece of paper. I wanted to recreate that but in a fresh way. The gold foil print was the first thing that came to mind. 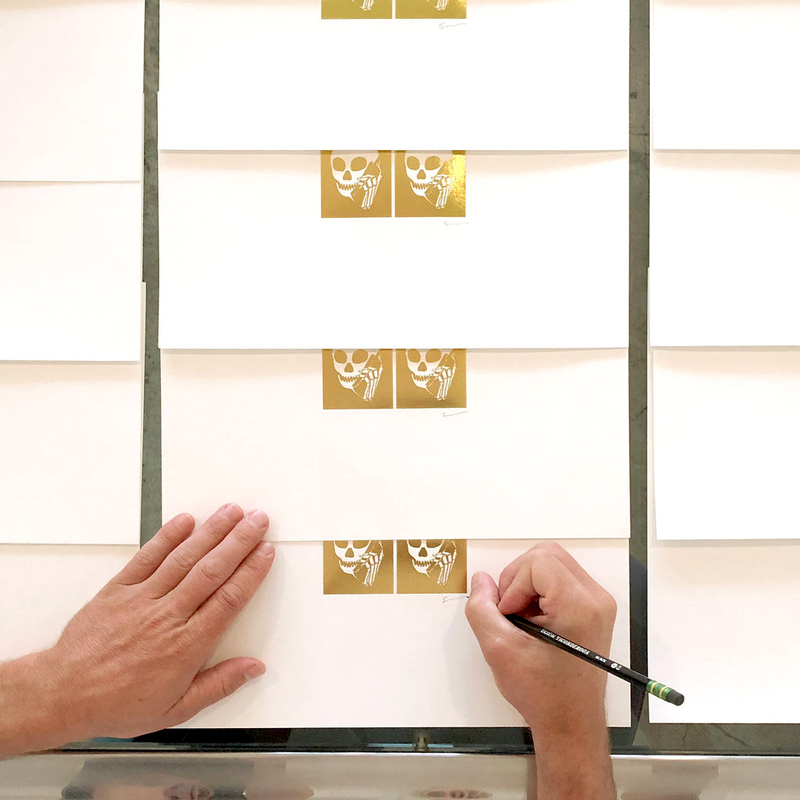 What did you like most about the gold foil? We’re covered with glares of light here in LA, it’s the perfect representation of that! 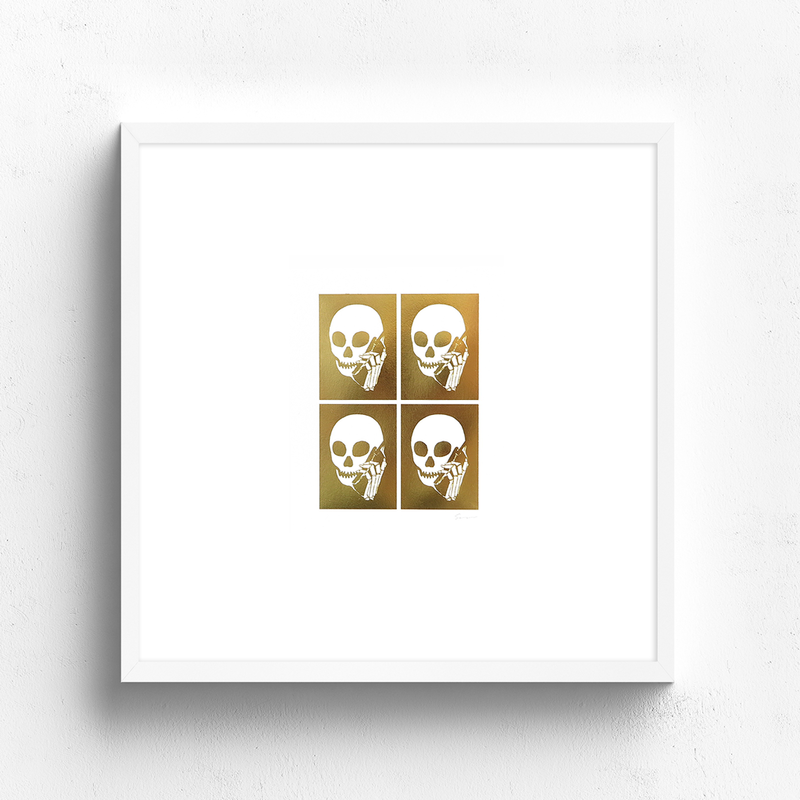 It’s called the Gold Foil Grid since I always pasted grids of Skullphone posters around town when I started putting them up in 1999. 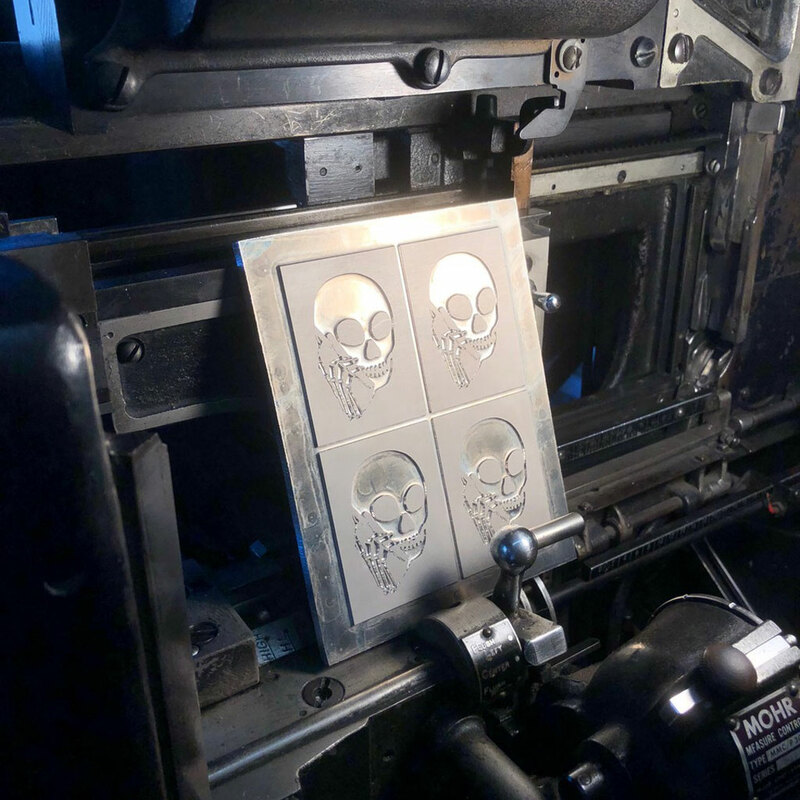 Even further back, in the mid 90’s, I managed a print shop with Benjamin Franklin presses and various platen presses, so it was personally nostalgic getting back into that environment to create the Gold Foil Grid. I love the history of print shops and the beginnings of mass communication. For this project I probably like most how simple and elegant it works regardless of my personal anecdotes! 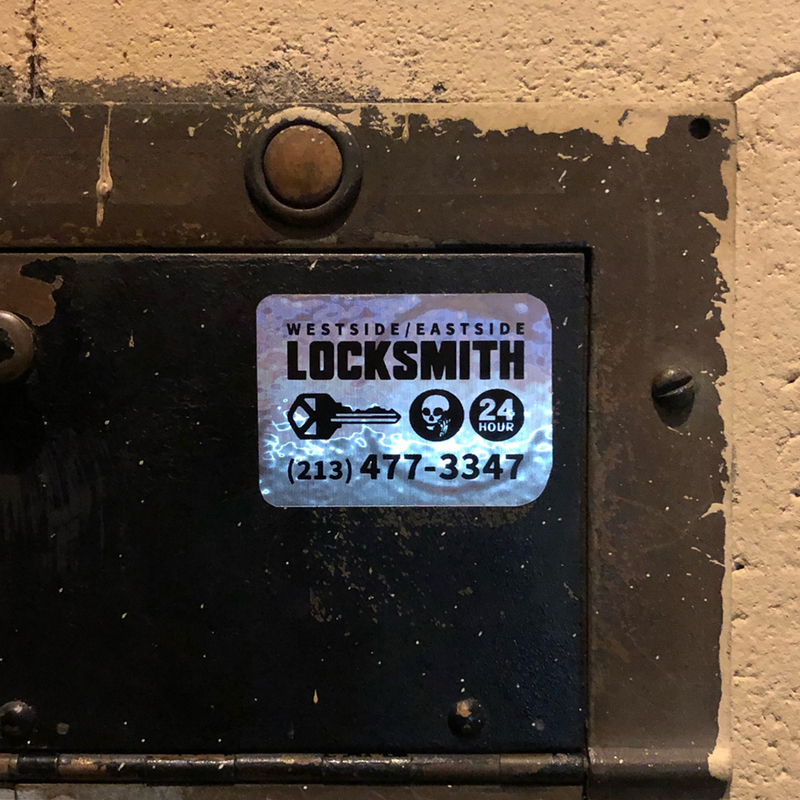 Where did the Locksmith print come from? One of the many challenges street artists have is that 90% of the illegal art is covered within 24 hours! Of course, this depends on where you put it. And back in the day people either REALLY got it or they really DIDN’T get it, and neither helped keep it on the street! I looked at what I could create unnoticeably in the middle and last! I started to replace small industry repair stickers on a roll down gates exactly as-is but with a very small Skullphone added. 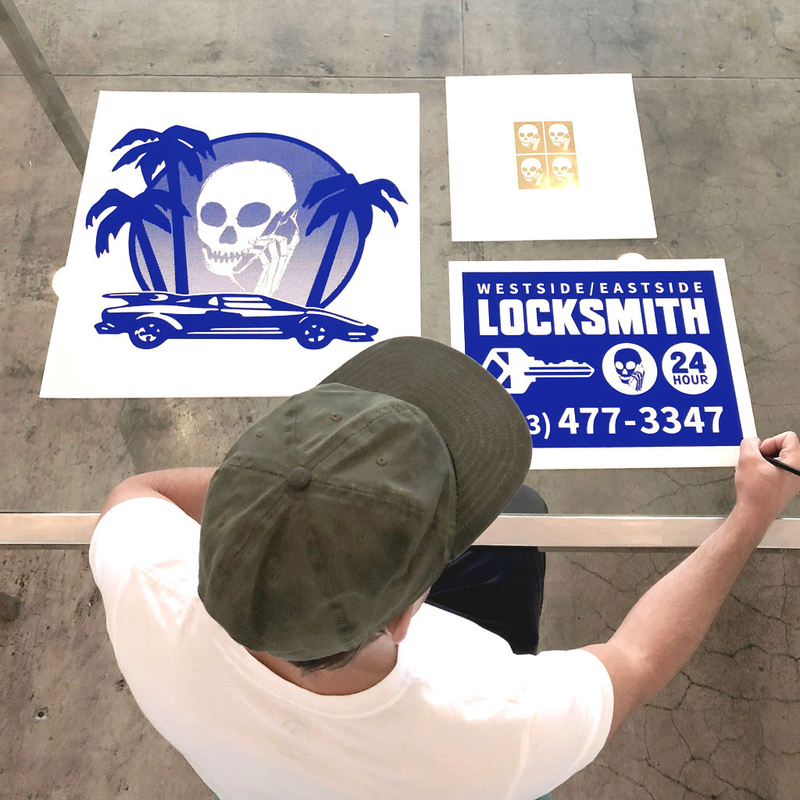 This Locksmith sticker is one I created from various locksmith stickers found throughout Los Angeles. When I was first invited into the gallery space I enlarged these stickers into large advertisements for the gallery walls, sort of flipping the script, with the art outdoors and the advertisements indoors. I am fascinated with the space between old and new, now and then, this and that, here and there. Yes! And one day we’ll reminisce about using these archaic keys which have been around us our entire life. It’ll all be fobs or whatever. And similarly, as Angelenos, we’re constantly in the Westside/Eastside commuting struggle. And it feels like I NEVER call a (213) number these days even tho it was the original and only area code for Southern California. I like how all that is included in this image. What do you like most about the SET? The blue color is like an ocean of blue! And with the reflective gold print? SO GOOD!